just so our baby knows that he/she is included in the picture. 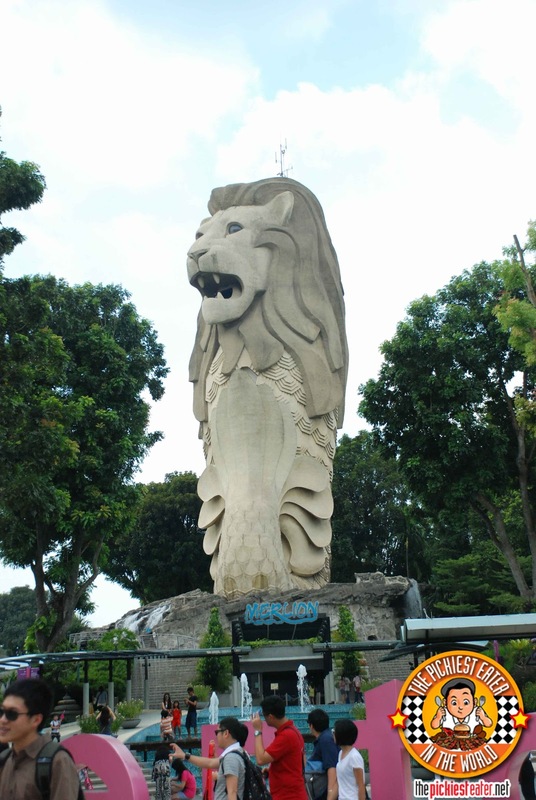 When you ask someone about the places to go to in Singapore, it's very likely that he or she would tell you that a trip to the Lion City would not be complete without going to Sentosa. That was the logic of Rina and Chaikka when we set our trek there for Day Three. 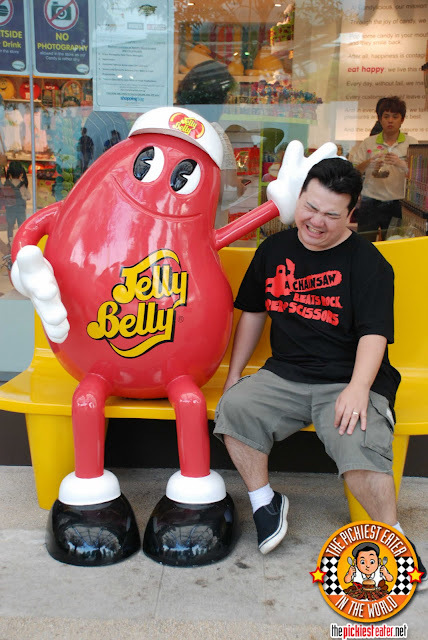 Considering Sentosa is dubbed as "Asia's favorite Playground", so you can imagine our excitement when I was planning the things that we could do there. But looking at the park map that I got from the hotel, and studying the attractions, I was starting to think that Sentosa wouldn't be as fun as I thought It would be, especially since we had just come from the awesomeness of Universal Studios. I did bring up that concern to the girls, but they were steadfast in their decision to go to Sentosa. They did have a valid point though.. Everyone they asked said they should go to Sentosa, and how often will they be in Singapore, so why not make the most of the chance. Outnumbered, I just went along for the ride, hoping for the best. Now, I've never been one to say "I told you so! ", but... Rina and Chaikka? If you both are reading this.. 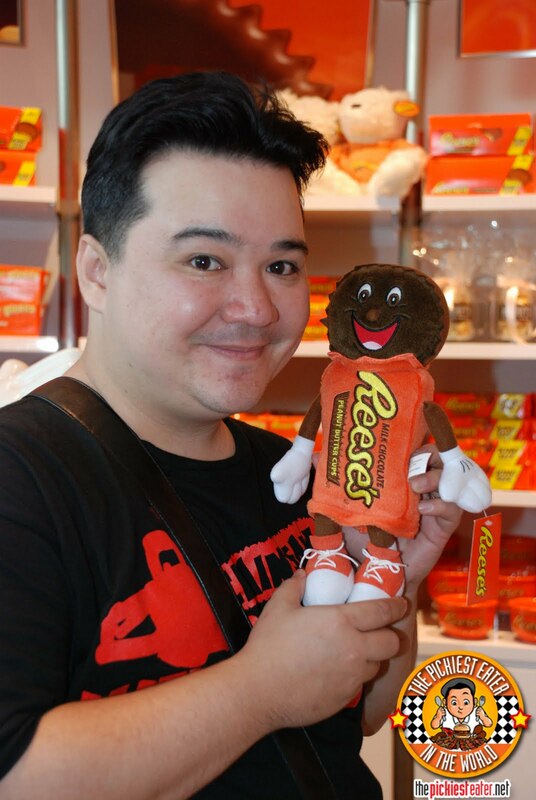 I'm sorry, I don't mean to put down the efforts of the good people of Singapore, but once you've got to a world class theme park like Universal Studios Singapore, you have to expect anything else to be a disappointment. After riding the Battle Star Galactica Roller Coaster, how am I supposed to be impressed with a Butterfly Park and Insect Kingdom? I get big enough bugs in my backyard, it's not something I look forward to seeing in glass cages. To be fair, Sentosa is more than that. There are some attractions that I believe would have been better appreciated had there not been a Universal Studios just a three minute train ride away. 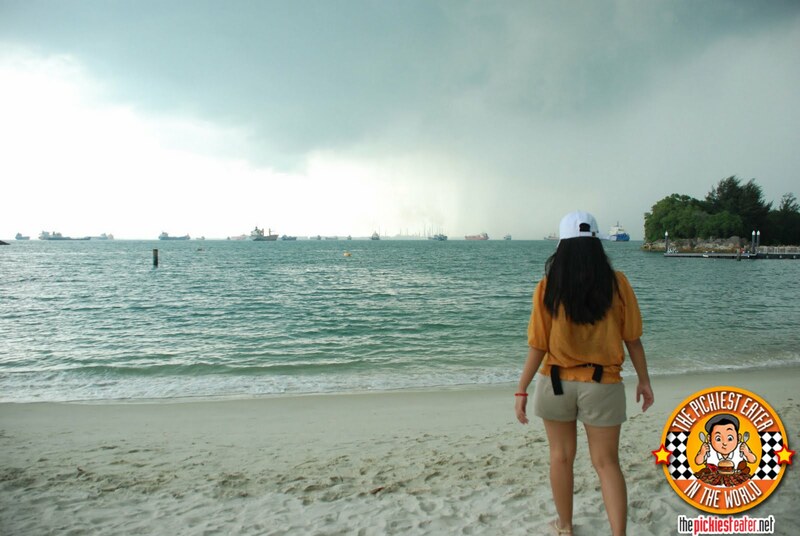 The main problem of Sentosa was that it didn't really get the feeling of a theme park. It seemed more like a public park. The staff had nowhere near the warmth of the crew working at Universal Studios. For example, When i asked for directions in USS, the man pulled out a map from his pocket and encircled all the important points and landmarks to make sure I wouldn't get lost (Lets just say it was the most secure walk to the bathroom I've ever had). In Sentosa, I asked how to get to the "Log Ride", the crew guy pointed to a vague direction, and said "THERE", then walked away. Of course, Sentosa doesn't have the backing and funding of Universal studios, so it would be unfair to compare facilities and such. But being pleasant to your guests is not something exclusive to big budgeted theme parks. 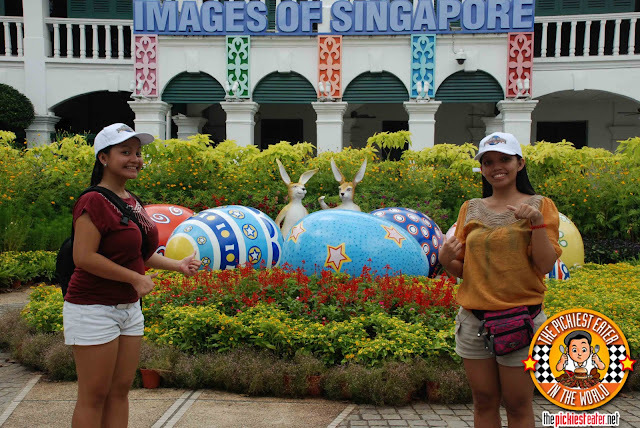 The "Images" of Singapore includes Easter Bunnies.. Apparently. Attractions-wise, well.. I dunno. Does the "Sentosa Nature Discovery sound like your idea of fun? Well what if I told you that your experience there would allow you to "explore interactive exhibits that showcase Sentosa's ecological history AND get acquainted with habitats found on the island and identify birds, wildlife and insects with clues they leave behind"...?!?! No?? I didn't think so. 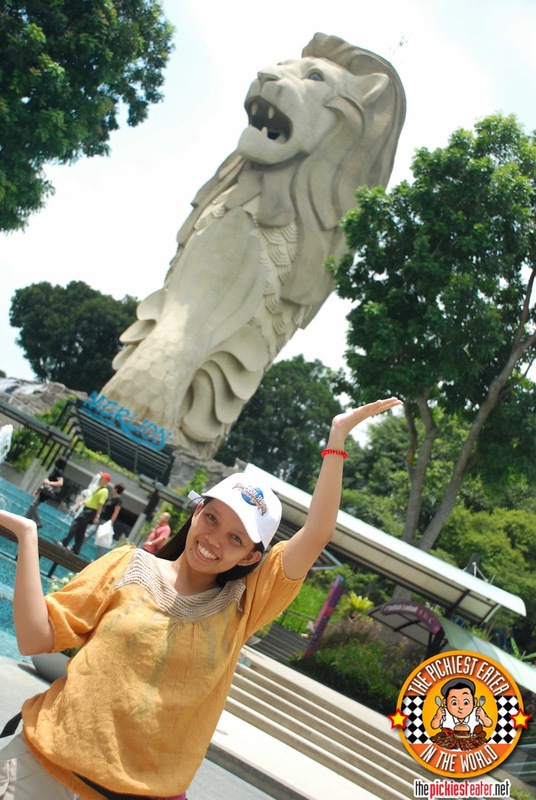 They did have the "Tiger Sky Tower", which goes 131 meters above sea level.. But we just came from the Singapore Flyer that same morning, the tallest Ferris wheel in the world, so going on that cute little "Sky Tower" didn't sound too appealing. 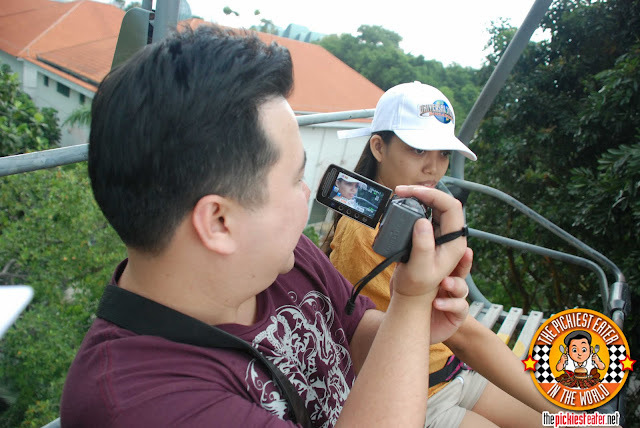 We finally settled on going on Sentosa's "CineBlast" and try their "Extreme Log Ride".. Which turned out to be one of the dumbest things on this planet. The movie is supposed to simulate a "Log Ride".. but.. umm.. not the Log Ride you expect from a normal theme park. Get this - you are actually a piece of wood.. A "Log" if you will.. and you are in a lumber mill (i guess).. You are then chopped up, and you need to make your way down to the.. umm.. "beach"(?).. to join the other.. umm.. logs... (I warned you it was really dumb). And guess what? 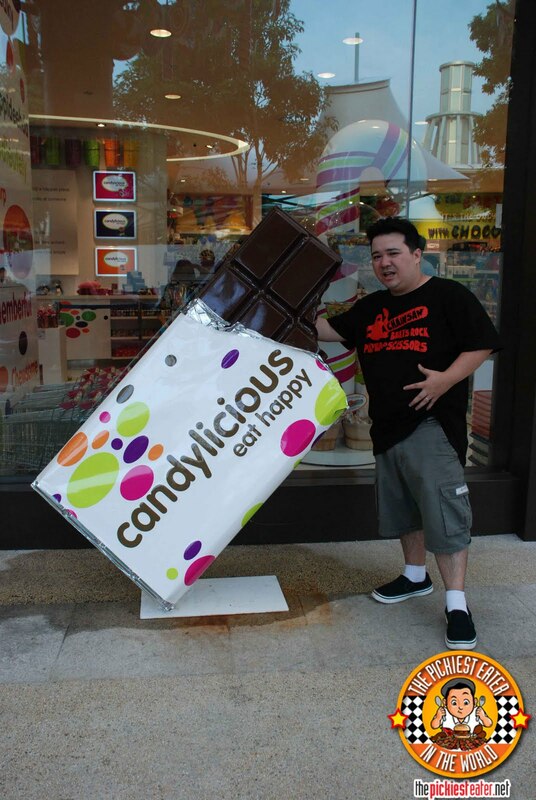 We spent SG$19 on it, so the joke was on us! 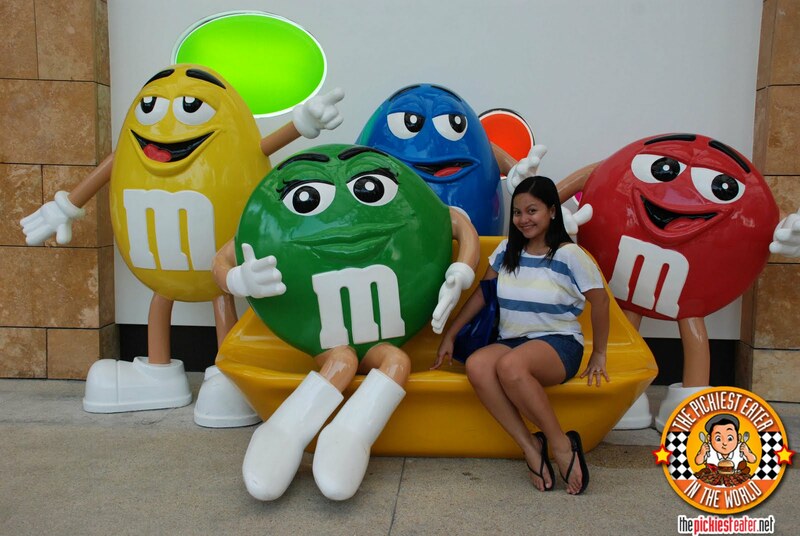 Though we were feeling cheated with our Cineblast experience, we refused to leave Sentosa on that sour note. So we decided to try "Skyride". 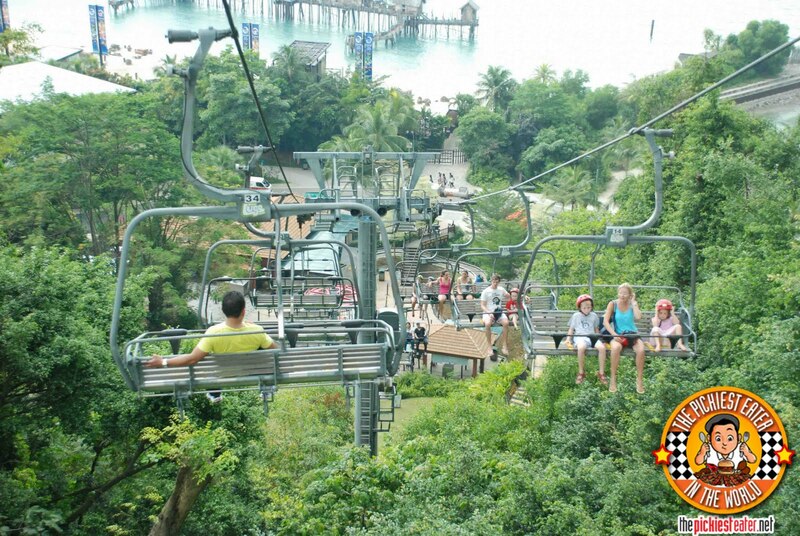 It's pretty much like those sky chairs used in skiing, and it was a great way to go down to Sentosa's Beach. I honestly wanted to try the "Luge", which is sort of like a little go cart without an engine. 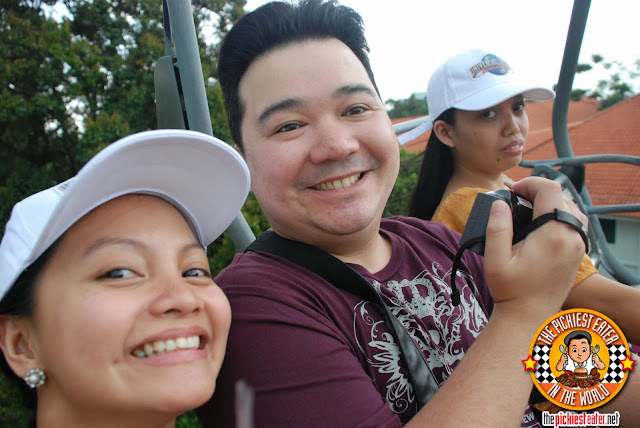 But of course, with Rina's condition, we didn't want to risk it, so we went on the Sky Ride instead. During our Singapore Flyer ride earlier that morning, Chaikka got a good laugh when I started freaking out when we started to raise altitude. So the moment I saw her freaking out as the Sky Ride began going higher and higher, I knew it was payback time! Apparently she didn't realize how high we'd go, and she really wasn't mentally prepared for it! Rina kept calling me "Sutil' so i stopped shaking the chair (spoilsport). Strangely enough, The Sky Ride didn't freak me out the way the Singapore Flyer did. But then again, we didn't go nowhere near as high as the Flyer did, so I guess that's understandable.It was actually a nice experience, although it wasn't so much an adrenaline rush as it was a nice way to enjoy a lovely afternoon. 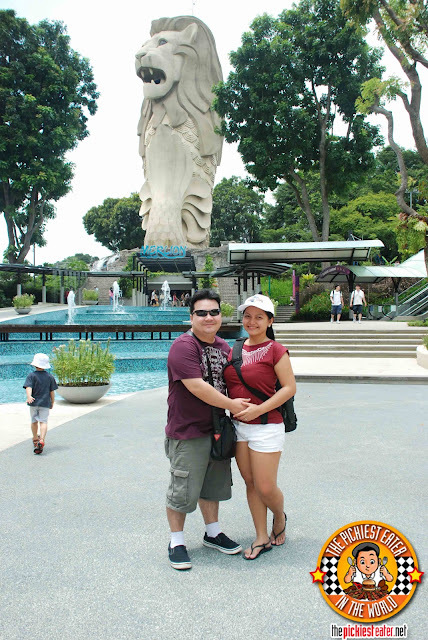 We headed off to the beach where Sentosa's famous "Songs of the Sea" performance is held. It's supposed to be an amazing cultural dance and laser light show, with full pyrotechnics and water jets to boot! Of course, for full effect, the shows are in the evening, and since we weren't going to be staying til dark, we couldn't watch it. 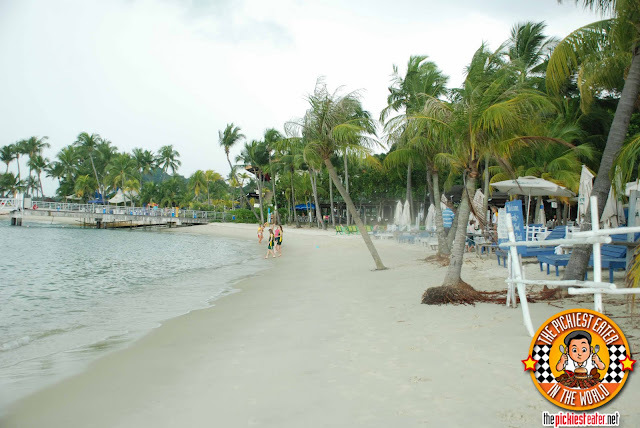 If you're been to a beach in the Philippines, Sentosa's beach will do absolutely nothing to impress you. It's a decent looking man-made beach, but nothing beats the natural beauty of mother Earth (awww). Given the industrialization of Singapore, I guess we shouldn't be surprised that off the shore, you see oil tankers and other large shipping boats in the horizon, instead of a beautiful oceanscape. Unfortunately, the storm clouds began to form within minutes of us reaching the beach, so we couldn't stay for very much longer. 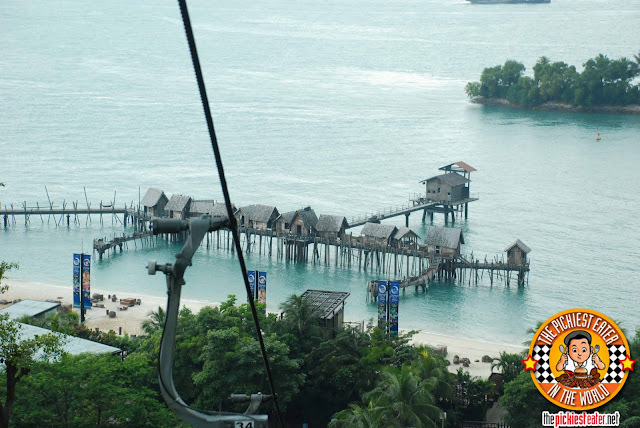 We made our way to the Imbiah Station, as we looked forward to the next stop of our journey..
Do I recommend a trip to Sentosa? Personally, I wouldn't go back anymore.. maybe just to see the "Songs of the Sea", but truth be told, I would have preferred to have gone to check out Clarke Quay instead. If you're looking for an adrenalin rush, I'd stick to Universal Studios.. If you're more into educational/nature tripping, then yeah, Sentosa just might be your thing. 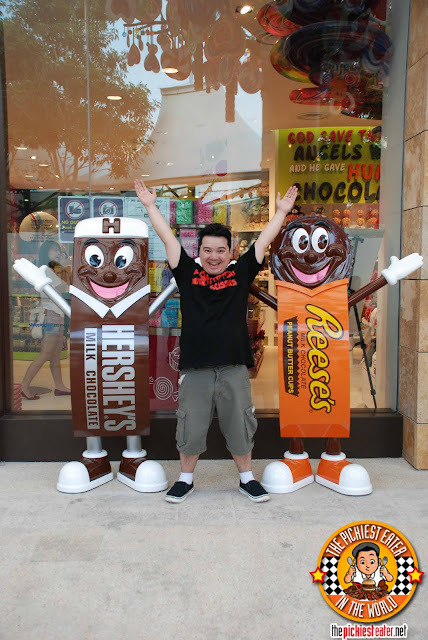 Honestly, I think we had more fun in Resorts World Sentosa! 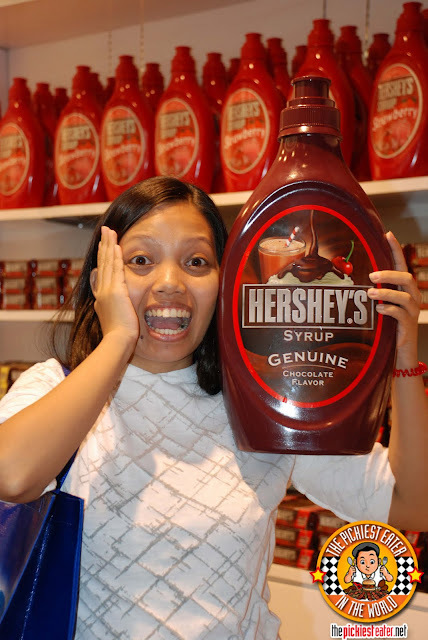 So Chai, you think you've got enough Chocolate Syrup? 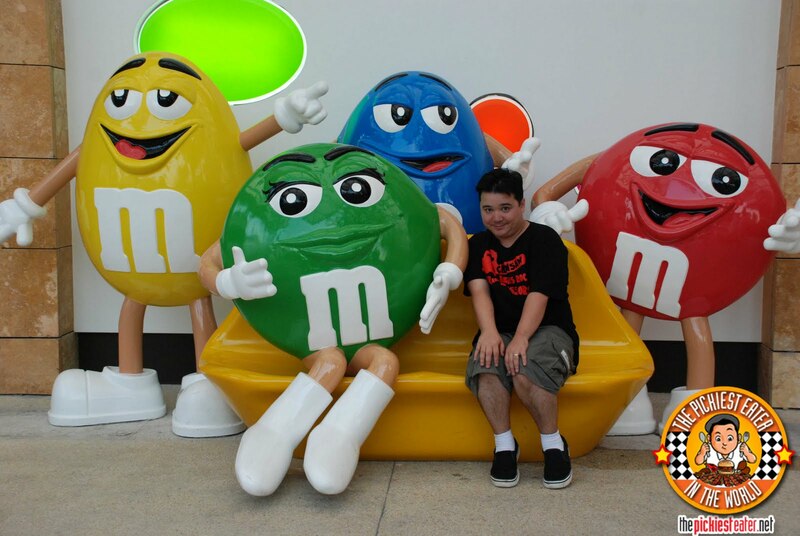 The Green M & M showing ME how to work it. It says "Eat Happy".. Not "Eat Healthy".. so don't judge me. You, sir, are a very funny guy.